Description: The Action Level Exceedance II with Parameters Report displays all of the parameters from the Analytical Results II Report and allows you to create the Analytical Results Report and the Action Level Exceedance Report together (displayed once in the Action Level Exceedance format). The Action Level Exceedance II by User Report compares values from a saved Analytical Results or Analytical Results II Report against one or more action levels (e.g. regulatory limits). Action levels may apply to the entire database or they may be specific to a facility or subfacility, a limited time period, a particular matrix, land-use, analytic method, fraction, depth and/or geologic unit. For further information on defining action levels, see Action Level Definition and Overview. Comparison | Operator: There are four options for the Comparison | Operator parameter. 1. "<" Within Limits (Exclusive): The analytical result is flagged as an exceedance if it is less than the action level and, if one exists, greater than the ACTION_LEVEL_MIN. Equalities are not considered exceedances. 2. "<=" Within Limits (Inclusive): Same as above, but equalities are considered exceedances. 3. ">" Exceeds Limits (Exclusive): The analytical result is flagged as an exceedance if it is greater than the action level or, if one exists, less than the ACTION_LEVEL_MIN. Equalities are not considered exceedances. 4. ">=" Exceeds Limits (Inclusive): (the default) Same as above, but equalities are considered exceedances. See also Using ACTION_LEVEL_MIN field. Comparison | Unit: There are two options for the Comparison | Unit parameter. 1. "REPORT_RESULT_UNIT": (the default) Values will be displayed in the units of the REPORT_RESULT column. Other columns will be converted to matching units as necessary. 2. "ACTION_LEVEL_UNIT": Values will be displayed in the units of the ACTION_LEVEL column. Other columns will be converted to matching units as necessary. Comparison | Significant Figures: There are four options for the Comparison | Significant Figures parameter. 1. "calc": (the default) Calculates the significant figures in the ACTION_LEVEL column and applies that to the report formatting, which is the way the original ALE Report functions. 2. "calc_result": Calculates the significant figures in the REPORT_RESULT_TEXT column and applies that to the report formatting, including the ACTION_LEVEL column. 3.1, 2, 3, 4, 5, and 6 significant figures. The report uses the selected number for output formatting. 4. "ignore": When this is selected, the data is presented in the same format that the data is in the database. •"Yes": (the default) compares the Action Level to the Result before the values are adjusted for significant figures. •"No": will make the comparison after adjusting for the significant figures selected in the previous parameter. Note that this only makes a difference when the Action Level\Comparison\Operator parameter is ">" (instead of the default ">="). •"Yes": displays the ACTION_LEVEL and REPORT_RESULT_TEXT columns in scientific notation. •"No": (the default) does not use scientific notation in the display of data. The Show Results options allow users to expand or limit the results included in the report output, and whether to include notes, based on matching and exceedances. The matching logic depends on if/which Matching options are selected. At a minimum, a "match" is an analytical result for which the analyte (CAS_RN) is present in the action level. At most, the analytical result and action level also have matching dates, subfacility, land use, depths, fractions, methods, facility, and matrix values specified. See the Matching section later in this article for further details. •Show All options (there are three): lists all rows from the Analytical Results II (AR) Report at least once, even if there is no matching Action Level (AL). When there is a match, then the ACTION_LEVEL_CODE and related columns are populated and the exceedance determination is made and displayed in the FLAG column. ▪If there is no match between the AR and any of the selected AL(s), then that AR row is included once with no Action Level columns populated. ▪If there are multiple selected ALs with complete AR matches, then the AR row is repeated for each additional matching AL. ▪If there are multiple selected ALs and some ALs do not match the AR, then only the row or rows with matching Action Levels are displayed. ▪If there is a matching AL based on CAS_RN, but additional input criteria do not match (i.e. an incomplete match), then the ACTION_LEVEL_CODE and related columns are populated, but there is no exceedance determination. A note is placed in the FLAG column to explain that no match was found. ▪When there are complete matches and/or complete non-matches, additional AR rows are included or excluded as described under Show All. ▪If there is a matching AL based on CAS_RN only, and additional input criteria do not match (i.e. an incomplete match), then the ACTION_LEVEL_CODE and related columns are populated, but there is no exceedance determination. A note is placed in the AL_REMARK and ALP_REMARK columns to explain that no match was found. Storing the notes in these columns, rather than the FLAG column (used in Show All Plus above) enables crosstab output with a single column for each chemical. •Show Only Exceedances: Lists only those Analytical Results that 1) match an Action Level and 2) exceed an Action Level. If a result exceeds one Action Level, but not a second matching Action Level, it is only listed once. •Show With Any Exceedance: Lists only those Analytical Results that 1) match an Action Level and 2) exceed an Action Level. If a result exceeds one Action Level, but not a second matching Action Level, it is listed twice (once for each Action Level). This enables crosstab output with a single column for each chemical (instead of one column or row for results that exceed one Action Level and another column or row for results that exceed both Action Levels. Flagging | Flag Non-Detects: There is a Flag Non-Detects option which allows switching between flagging non-detect results when the detection limit exceeds the action level, and not flagging non-detect results regardless of the detection limit. Flagging | Exceedance Flag: This allows the symbol used as the exceedance flag to be changed from the default value of "x". Flagging | Warning Flag: The warning level flag allows results to be tested against the warning levels (and WARNING_LEVEL_MIN) for the selected action level code. When crosstabbing the report, the two flags allow for exceedances of the action level and the warning level to be highlighted differently. Note: Using the Action Level Exceedance II Report in Crosstab will now allow data that exceeds the WARNING_LEVEL to be highlighted with one format and/or color, while data that also exceeds the ACTION_LEVEL is highlighted with another format and/or color. Assuming the normal relationship where the WARNING_LEVEL is less than the ACTION_LEVEL, the WARNING_LEVEL field must be placed before the ACTION_LEVEL field in the column or row header section of the Crosstab interface to get the desired results. Otherwise, the "Exceeds Action Level" color will be set first and then be over-written by the "Exceeds Warning Level" color, since any value that exceeds the higher Action Level will also exceed the Warning Level. 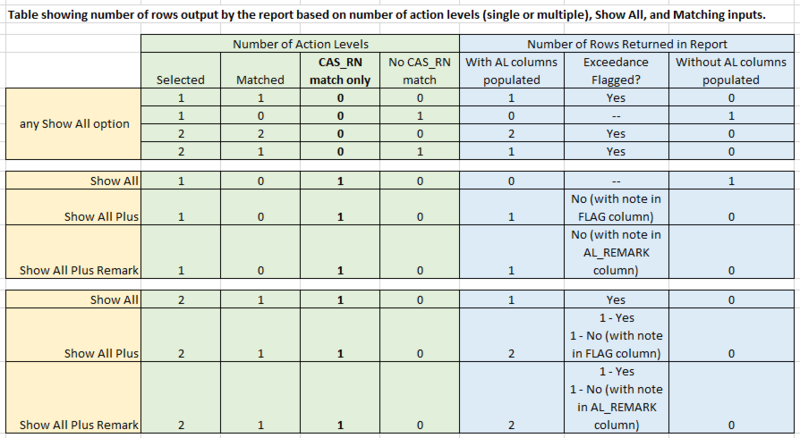 Analytical results are compared to action levels only when both the Matching report parameter is selected (check in the check box) and the column for that criteria in either DT_ACTION_LEVEL or DT_ACTION_LEVEL_PARAMETER is populated. See the help article Action Level Definition and Overview for further information on defining action levels. Match Depths: When Match Depths is selected, the Depth Type will be compared to the min_start_depth and max_end_depth of the action level. ▪Sample Depth: This is the default setting that matches DT_SAMPLE start and end depths to the minimum and maximum depths of the action level(s). ▪Water Level Depth (unconfined): This selection uses DT_WATER_LEVEL.WATER_LEVEL_DEPTH as the start and end depths for matching the minimum and maximum depths of the action level(s). The most recent non null water level depth for a given location of a sample is included in the output, provided that the measurement_date is prior to the SAMPLE_DATE + 5 days. ▪Water Table Depth (confined): This selection uses DT_WATER_TABLE depth values as the start and end depths for matching the minimum and maximum depths of the action level(s). The water table record must have type of 'CONFINED' and sequence of 'STABILIZED'. The depth value from DT_WATER_TABLE for the location of the sample will be included in the report output. The following match options are also available. Match Land Use: When Match Land Use is selected, Action Levels will only apply to Locations where DT_ACTION_LEVEL.LAND_USE = DT_LOCATION.LAND_USE. Match Geologic Unit: When matching geologic_unit_code, the following three additional selections are required. Geologic Unit Code or Type: This determines whether the actual GEOLOGIC_UNIT_CODE (as defined in the Geologic Unit Code Column parameter) will be used in matching with the action level or if the GEO_UNIT_TYPE from AT_GEO_UNIT for the chosen GEOLOGIC_UNIT_CODE should be used instead. ▪Geologic Unit Code: Use the actual geologic unit code for matching. ▪Geologic Unit Type: Use the GEO_UNIT_TYPE from AT_GEO_UNIT for matching. In order for this option to work, the GEO_UNIT_TYPE must also be added as a geologic_unit_code in RT_GEOLOGIC_UNIT so that it can be set as the GEOLOGIC_UNIT_CODE for the action level. The GEOLOGIC_UNIT_TYPE must also be assigned to the locations/samples in the relevant data tables (DT_STATIC_PROP, DT_WELL or DT_LITHOLOGY as listed below). Geologic Unit Code Columns: This is a single-select parameter to identify which column should be used as the geologic_unit_code when matching with the action level. The column selected will be included in the output. The Include: Depths Fields from DT_ACTION_LEVEL option must be checked for the Geologic Unit matching to work properly. It adds the following columns from DT_ACTION_LEVEL to the report output: MIN_START_DEPTH, MAX_END_DEPTH, DEPTH_UNIT, and GEOLOGIC_CODE_UNIT. The associated Action Level Exceedance II by EDD Report is used for checking exceedances within an EDD (instead of within a saved report), and is commonly used as an Environmental Information Agent, (EIA), or trigger, within EQuIS Enterprise. Click here for the earlier version of this report. Report Dependencies: This report depends on the Analytical Results II Report and must have the 50943.dll available to work properly. Note for Enterprise Use: Since this report depends on the Analytical Results II Report, enabling it in Enterprise requires storing the EarthSoft.Reports.Library.50943.dll in the Enterprise bin folder (typically at C:\Program Files\EarthSoft\Enterprise\bin). Input Parameters: A selection made to customize the output of a report. Note that the Additional Fields parameter may be customized as explained here.